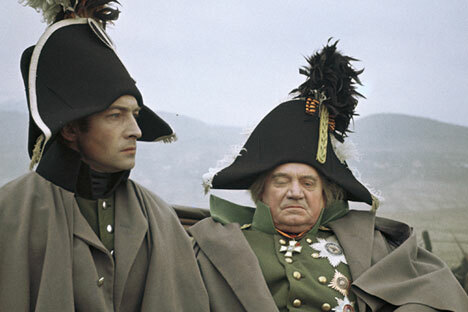 Vyacheslav Tikhonov as Bolkonsky (left) and Boris Zakhava as Kutuzov in the film "War and Peace". Thousands of people across the world will read Leo Tolstoy's 'War and Peace' online between December 8 and 11. In the run-up to the event, RIR outlines some interesting trivia about Russia’s most famous epic. 1) ‘War and Peace’ is around 1300 pages long, but it is not the longest novel ever written. That distinction goes to the little known Artamène ou le Grand Cyrus, which weighs in at a huge 13000 pages. ‘War and peace’ is among the longest of the 19th century European epics. The epic’s first two editions were divided into six books, unlike the now standard four. Tolstoy made these and other changes for the third edition of the novel in 1873. 2) Tolstoy did not originally envision a novel about the Napoleonic wars. He had planned to tell the story of an old ‘Decembrist;’ one of the Russian officers who led a failed attempt to overthrow Tsar Nicholas I on December 14, 1825; who was allowed to return home from exile in Siberia 30 years after the revolt. Tolstoy, however, realized he would not be able to explore why this character took part in the uprising without describing his experience in the Napoleonic wars. There was also the consideration that the censors would not be favourably inclined to a book about the revolt, so the “story of a Decembrist” turned into an epic novel. 3) At his wife’s insistence, Tolstoy removed the fairly explicit description of the main character Pierre Bezukhov and his first spouse Hélène’s wedding night. Sophia convinced her husband that the scene would never pass the church censors. 4) Another controversial plot twist concerning Hélène Bezukhova, who Tolstoy apparently wanted to symbolize the dark and sexual aspects of human nature, did make it into the novel. Hélène, a young woman in her prime, dies unexpectedly in 1812, leaving Pierre free to marry Natasha Rostova. Russian high schoolers, who study the novel at the age of 15, usually see this death as a conventional trope needed to move the plot forward. A more mature reading reveals that Tolstoy leaves subtle hints that suggest Hélène dies after a failed abortion. 5) The Rostovs and Bolkonskys are thinly-disguised embodiments of Tolstoy’s own family members, who were descended fom an ancient Russian noble line. The character of Nikolay Rostov draws a lot from Tostoy’s father, Nikolay, who was also a hero of the Patriotic War of 1812, and a lieutenant colonel in the Pavlograd regiment, mentioned by name in the novel. Marya Bolkonskaya bears a resemblance to Tolstoy's mother, Marya Tolstaya, née Volkonskaya. The description of their wedding ceremony is similar to that of Tolstoy’s parents, and the same is true of the characters’ estate, ‘Lysye Gory’, which resembles Tolstoy’s own home, ‘Yasnaya Polyana’. Nevertheless, when the novel was published, only people who actually knew the Tolstoys could notice the similarities; there was no Wikipedia then!! Tolstoy insisted that the main characters’ names only sounded like names of Russian nobility because this made it easier for him to insert them into the historical context and allow them to communicate with the work’s numerous actual historical figures; from Moscow’s governor Fyodor Rastopchin to Napoleon and Alexander I. 6) Tolstoy’s wife copied the novel as he wrote it, producing at least eight complete hand-written manuscripts, with some episodes re-written up to 26 times. It took Tolstoy five years (1863-1869) to finish his epic, during which Sophia gave birth to four of their 13 children. The pair had married a year before he began work on War and Peace, when he was 34, and she was 18.